You begin your recent article on ISOC by referencing concepts such as “the deep state” and “the network monarchy”. Duncan McCargo has now stated that the concept of “network monarchy” may no longer define the situation today. So I’d like to ask, in what ways do these concepts remain analytically useful to contemporary Thai politics ? Or, in what ways are they inadequate ? I have to state first that my article didn’t apply either the deep state or network monarchy as an analytical framework, though I did mention these two approaches to analysing the contemporary Thai state. Both these concepts mention and attribute some importance to the role of the military in politics—but ultimately not a great deal. They see the military as playing an important role only during coups, but fail to see the other mechanisms [by which the military exercises power], especially its political machinery. It’s as if the military’s political influence is practically insignificant in the absence of coups. So my work tries to show that there exist other mechanisms of the military which have been operating constantly and extremely vigorously, especially since the 2006 coup. What relevance do these two concepts still have for analysis of contemporary Thai society ? I think McCargo has said point blank that the concept he himself once brought forward cannot be applied to the present moment because the importance of the concept is contingent. 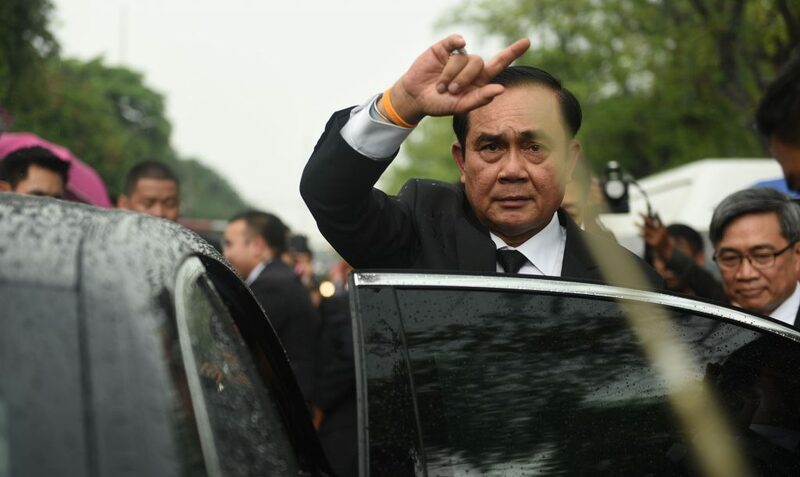 The crucial link that held together the threads of the network monarchy and which mobilised its constituent nodes, all those institutions and the organisations, was the phra barami [glory] of Rama 9. When Rama 9 passed away, royal hegemony disappeared as well. But can we no longer apply the concept of network monarchy to Thai politics at all ? I think it is still useful for understanding the various actors or institutions that play a role in undermining, destroying or controlling parliamentary politics. We still see a multitude of actors—whether it’s the courts, the military, the state bureaucracy—that still exist, that still continue to have life. They may not operate in a coordinated fashion and they may not have the power that they once did. But these institutions are still at work. How can we make sense of why they continue [to exercise influence] ?We have to look back in time and examine their origins, their histories and what led to these actors being able to play a role in so much. In my own research on ISOC, I cannot avoid looking back at the role of the military in its relationship with the monarchy. Secondly, what is the utility of the deep state concept ? I think the deep state is useful for explaining the political behaviours of various groups that try to intervene to control electoral and parliamentary politics. But the deep state presents these groups as operating in an alliance that plots. It’s a conspiracy theory. But we do not know the details of the conspiracy. What do they talk about ? Where do they talk ? When do they talk ? Who is present ? What have they agreed on ? Does the deep state act on what is agreed upon or not ? Nobody can say, because it’s based on a conspiracy theory. Okay, I think the concept of the Deep State may help to capture several phenomena that we observe. We can make a pretty good guess about how a court will rule on a certain political case, because we believe that an agreement has been reached behind the scenes. This concept can assist in explaining politics during periods where we live under an elected government, but where that elected, civilian government has little power to effectively control the actors and institutions that make up the state. But we no longer live under an elected government. We live under a junta. Is this really a “deep” state ? I think that the mechanisms currently working to undermine a democratic system of government are completely unabashed. There’s no longer a need to be hidden or secretive. Now the military has come out with its nationalist Pracharat [“State of the People”] policy. [Editor’s note : The Pracharat policy initiated by General Prayut Chan-o-cha involves projects nominally aimed at promoting co-operation between the state, the private sector and local communities in the pursuit of sustainable development].They’ve openly announced that they want to establish centres to provide training four times a month to communities in all four regions, in more than 10, 000 villages across the country. The aim is clearly to ensure villagers elect “good people”. And we all know what the politics of “good people” is about. They’re going about this policy openly and brazenly. There are no smoke and mirrors. There’s no need for conspiracy anymore. So I think the concept of the deep state has limitations when applied to periods when Thailand is under military rule. During these times, the military does not need to be surreptitious. They do everything systematically, completely by process. But the concept of the deep state may become relevant again if Thailand returns to a democratically elected government which is not popular with traditional elites and not desired by the conservative side of politics (who then try to bring it down). Then, we may be forced to turn to the concept again. So we see that the military government is attempting to inculcate certain ways of thinking, through various discourses revolving around security and the monarchy and so on. What is it when everyday people are imbricated into the workings of the deep state ? Let me give an example, that might get to what you’re asking about. We know that the last coup was the product of calculated planning—conspiring. It was a deliberately orchestrated coup that began with the People’s Democratic Reform Committee (PDRC), whereby Suthep Thaugsuban and allies in the Democrat Party created a situation of political deadlock to persuade the military to enter and remedy the impasse. This process to create a state of irresolvable political conflict relied blatantly on [leaders] finding a way to mobilise the masses, on persuading their supporters to see politics from their point of view, so that they would take to the streets as a force to place pressure on the Yingluck government until it could no longer function. So it’s more accurate to ask : have civilians have been pulled in to become instruments of the deep state ? In the aftermath of past coups, juntas have always drawn upon discourses of “crisis” that they have allegedly intervened to resolve. But the aftermath of the most recent coup in 2014 has been strange—if I can use the word “strange” ! Previous juntas stayed in power for a year or two before having to concede elections. In contrast, the NCPO has been in government for four years and is showing no signs of relinquishing power. Why have resistance groups not succeeded in pressuring the NCPO to concede elections ? I stand by the answers I have given before. I think that Thailand’s civil society is weak—NGOs, human rights advocates and mass media. This is true especially of mass media, which is starkly divided between two poles. Over the past four years, no matter how problematic the junta’s actions have been, some mass media outlets have remained steadfast in their support, and constantly protect the junta. Don’t think this does not have an effect on the masses who follow their [television] programs, who are convinced to continue supporting the military government. This state [of political division] has never existed before. If we look back at the cases of 14 October 1973 and May 1992, civil society, political parties and mass media were united in resisting the military. In May 1992, while some political parties allied with the military, these were weak and lacked a wide popular base. But what we see now are conservatives reaching a popular support base and exercising power through mass media. Mass media plays a constant role in assisting to promote the legitimacy [of the junta]. No matter how problematic the junta’s actions, no matter how many scandals are exposed, there are always people in the media industry who are willing to defend it. An important point, for those who pay attention, relates to the largest Thai NGO or civil society organisation : the network revolving around the Thai Health Promotion Foundation. You see figures like Dr Prawet Wasi still participating in the nationalist Pracharat projects. This is a significant segment of Thai civil society still giving support to the military government, and participating in the junta’s legitimacy-building. And so it is that we have one of the worst military governments that Thailand has ever seen. So long as people power is weak, it will be difficult to resist and compel the NCPO to relinquish power. To what extent is the NCPO’s refusal to relinquish power specific to this “period of transition”. Ajarn Kasian [Tejapira] once said that in periods where a hegemonic power is absent, configurations of power are uncertain and not fixed as they once were. Different groups scramble to define a new status quo. Do they want to stay in power for long ? Of course they do. I think all juntas want to stay in power for as long as possible. But they evaluate whether this is really possible or not. If we look at the 2006 coup of Surayud Chulanont, the phenomena of the red shirts had not yet appeared. [The coup-makers] had learnt the lesson of May 1992 and gauged that the Thai people would not accept a military government for long. As such, they followed through with their promise to stay in power for a year before arranging elections—though not before pushing through a new constitution and laws to augment the military’s power. But in the case of the NCPO, I think they laid careful plans from the very day they declared martial law. With the declaration of martial law came the swift suppression of the red shirts at every spot they mobilised, in every province. Soldiers entered villagers to quash their presence. There was a complete crackdown along Utthayan Road. Every leader of the movement was detained. [Editor’s note : this scale of suppression was not seen in the aftermath of the 2006 coup.] After that, I think the NCPO learnt what needed to be done to prevent the reemergence of the red shirt movement. They had learnt that the red shirt movement, if allowed to mobilise, would be a danger to its power. [We can see then that] the NCPO is trying to lay the foundations to institutionalise its power, to secure it for the long-term. Even if we no longer have a prime minister from the military after the next election, the power that they have institutionalised through mechanisms in the constitution will still exist. [Editors note : for an overview of how the constitution will entrench the military’s political influence even after the election, such as through military-appointed seats in parliament, see this article by Khemthong Tonsakulrungruang.] The military’s power is entrenched. But even military governments who remain in power for a long time may not get to stay as long as they would like. The National Peace Keeping Council that seized power from the Chatichai Choonhavan government had no intentions of relinquishing power [before the 1992 protests]. General Surayud also hoped to remain as Prime Minister for a while, since he oversaw an [appointed] legislature that supported his rule. But they could not hold onto their power because civil society was united in resisting their regimes. But in the case of the NCPO, civil society is extremely, extremely weak. Groups who try to fight for democracy, such as student activists, are subsequently weak as well. Movements do not bloom. Over the past five years, we have seen a number of elections in Southeast Asia vote out long-standing regimes and vote in civilian (though still imperfect) leaders, most recently in Malaysia and Burma. How does popular engagement with politics in Thailand compare to other Southeast Asian countries ? What explains the relatively weak and small scale of resistance activities against the junta ? The phenomena of Thai people turning right, calling for intervention from the military and being opposed to elections—a large number of people are opposed to elections—it’s different to what we have seen in Malaysia and Burma. You have to understand that the political history of these three countries are different. In the case of Burma, it’s clear that military governments were in power for a long time. Before there was an opening for elections and the emergence of a civilian government in 2011, there were several instances where civilians rose up in protest. That made it obvious that most of the Burmese population had had enough of military rule. Having lived under military rule since 1962, they could see it led only to failures, both economic and political. The military also failed to address the problems faced by minority groups. But the history is different in Thailand. We jump back and forth between military rule and elected governments. As for Malaysia, we saw voters turn to the former opposition party led by Mahathir because they’d had enough of the rampant corruption under UMNO, especially under the leadership of Najib Razak. But do former UMNO supporters reject the legitimacy of the party’s claim to represent the Malaysian people ? I’m not sure, because Mahathir has long been a popular leader among Malays too. The recent reaction against UMNO is about corruption [more so than a wholesale rejection of what UMNO stands for]. But I think in the case of Thailand, we’re not seeing a crisis per se, but a large number of people have really lost faith in electoral and parliamentary forms of government, as well as in politicians. We have to see that this state of affairs has two causes. One half is the politicians themselves. We have to accept that politicians in our country don’t give a damn about being criticized by civil society. The problem of corruption certainly exists in Thailand, more or less. Perhaps it’s not as pervasive an issue as people have been incited to think, as in the case of Yingluck’s rice pledging scheme. I think there are a lot of issues that occupy a grey zone, because they are the product of several problems at once. The absence of clarity meant [corruption cases] were politicised rather than about pressing for just investigations. One part of it is that many politicians have never thought to reform themselves and participate in a fair and legitimate system. But the other part relates to a process that has taken place over at least the last 10 years to undermine the legitimacy of an electoral political system. It’s a process that paints people who exercise their electoral rights as lacking in quality, because they are stupid, poor or unwell. Politicians are painted as immoral. So much of this has been the work of groups that desire to interfere in and control the political system. If Thailand has elections as scheduled, how would you classify the post-electoral regime ? The answer depends on the election result. Professor Prajak Kongkirati defines the current system as “military guided authoritarianism”—an authoritarian system that is led by members of the military. Another word is “guardian”. Perhaps we might consider the term “military guarded authoritarianism”. By “guarded”, that’s a step down from a system where the military leads [absolutely and on all matters], choosing to turn left or right, to choose this and that, to pass a military budget that takes no notice of how the economy is faring. If the military is only a guardian, it may not be able to intervene and decide the outcome of every issue. Suppose after the election the prime minister is not one of the military’s own, but is a civilian who is acceptable to the military. The military’s control over political affairs would be imperfect. The game changes as the system takes on parliamentary elements. Though we may view the military as exercising absolute control over politicians, I think this would be reduced [in a formal parliamentary system]. Even politicians co-opted by the military would enjoy increasing bargaining power. As such, if the next election results in a civilian government, I think the regime would then be what we call “military guarded authoritarian”, a system in which the military is vested in protecting. The military still reserves the power to stage a coup, but it is satisfied on some level with the bargaining power that is still has. It still receives the things that it desires more or less, though perhaps not as easily as it currently does while the NCPO rules. Under the 2017 constitution, there is no way for the regime to be fully democratic and nor can the regime be called a democracy. If the military succeeds in installing one of its own as prime minister, the military have vested interests in maintaining the status quo. But suppose a party that is opposed to the military gains a majority and has the right to form government. What kind of situation are we looking at then ? It will be difficult for Pheu Thai to establish a single-party government. It’s clear that the electoral system has been designed to prevent Pheu Thai from receiving a landslide majority and establishing government. But what if Pheu Thai forms an alliance with two or three small parties ? Will it then have enough votes to form government ? I think that the small parties which previously allied with Pheu Thai are seeing that being in government would not be an easy time. The government would be extremely constrained. It would probably have to endure various obstructions as did Yingluck’s government. This does not even factor in the possibility that politicians who ally with Pheu Thai may be themselves targeted. Realistically, it will be difficult for small parties to align themselves with Pheu Thai. Let’s talk about political parties. Recently, we’ve seen the military entrust individuals within its network with co-opting MPs from other parties in several provinces to support the military-aligned party. These MPs have included red shirts. Do you think these deals will result in the kind of success the NCPO is hoping for ? I don’t want to guess how many seats a given party will receive. These guesses never seem to be right and I don’t really have a research background in rural areas. My knowledge is really just based on going out and meeting people, and evaluating the things that I see. But I think that after the past two or three elections, even though a coup seized power from the Thaksin government, Thaksin-affiliated governments have always returned. [Other parties and the military] haven’t been able to win the hearts of red shirts. Now they probably see that they can’t win over the red shirts because the policies promoted by the Thaksin government created enduring loyalty. They’re seeing that people living in rural areas are consistently and increasingly deciding political allegiance on the basis of policy., especially in the north and northeast. So now we see the NCPO cooperating with the newly-established [military-aligned] party to buy the popular support of peasants through development projects—for example, the Pracharat projects are of course an injection of funds into rural areas in the name of the NCPO. We are even seeing salary raises for public servants and the provision of assistance to teachers in debt, policies of that kind. These projects extend to ISOC’s mass organisations, which oversee various projects that increasing offer benefit packages to people who participate. We are seeing the NCPO use several bureaucratic channels, including development projects, to buy popular support. Will these projects be successful ? I think they reveal themselves as not terribly effective once you speak to villagers who have had experiences with the Pracharat projects. They can see through it. Take the policy [installed by the NCPO] of a 300 baht month wage coupon. All the villagers I meet complain that the only people who reap benefits from the NCPO’s governance are large businesses who cooperate with the junta. [Editor’s note : for more reading on the NCPO’s business networks see Prajak Kongkirati and Veerayooth Kanchoochat’s recent journal article “The Prayuth Regime : Embedded Military and Hierarchical Capitalism in Thailand” or Paul Chambers and Napisa Waitoolkiat’s book “Khaki Capital : The Political Economy of the Military in Southeast Asia”). Whereas for them, 300 baht hardly helps with anything. A villager might spend a whole day travelling into the city [to work]. They foot the transport fees even though they aren’t paid for the time spent travelling. Not to mention that you can only spend the 300 baht at certain stores. Despite the many efforts of the NCPO, they still can’t win the support of ordinary people. On the other hand, the political parties being backed by the NCPO must love these development projects. Without having to invest anything themselves, they access infrastructure to assist in canvassing votes. I do think that Pheu Thai will receive fewer votes than it did in the past, but not so much that it becomes a minor party. If the election still ends up being a Pheu Thai victory, I think middle-class academics opposed to the red shirts, and who look down on people from the provinces, will finally have to face the inaccuracy of the view that red shirts merely trade their votes for short-term, piecemeal rewards. If we’re being real about it, several of the NCPO’s Pracharat development projects are precisely aimed at buying votes. If villagers still don’t choose [the military-backed parties], it will show that they attribute more importance to policy at a national level than to those piecemeal projects through which the state injects funds into villages. Just a little bit more about ISOC, but in the explicit context of the present day. From your studies, what exactly have ISOC’s activities over the last two years involved ? ISOC’s activities can be grouped into four broad categories. The first is subduing and suppressing civilian resistance activities. The second is mobilising the masses through training, education, radio and mass media, and this is aimed at both already conservative and “neutral” groups. If you pay attention, you’ll find that ISOC buys advertising space in ordinary newspapers to promote its mass organisations. If you read them carelessly, many pieces look like normal news stories. But when I see them, I know they’re advertisements placed by ISOC. ISOC mobilises the masses to dance to the rhythm that it desires. Third is playing a role in controlling the political lives of civilians at all levels, both in urban and rural areas. In the past, the operations of ISOC were aimed at rural areas infiltrated by communists. But these days, ISOC has branches in Bangkok and all 77 provinces. It has branches at all geographic levels : nationally, regionally, provincially all the way down to the villages. The operations are extensive. ISOC is intent on controlling the thoughts and political activities of civilians. [The military] does not believe in letting civilians think and act freely, but rather views ordinary people as an important force for proliferating the interests and ideologies of the state. Fourth is the placement of military power above all civilian institutions, violating the principles of a democratic society. The military should operate under the oversight and policies of an elected government. But the persistence of ISOC under security legislation places the military in a superior position with the authority to command various civilian institutions. Consider the scenario where our future prime minister is an elected civilian. Will they assume the position of ISOC director, placing ISOC under civilian control ? That would be an illusion. If we look at all the important positions in the ISOC command from the deputy director, chief of staff, down to the individuals who staff the main units of ISOC, such as the mass organisations and intelligence : they all come from the military. It is these people who perform the duties of evaluating security threats, formulating strategies and managing those threats. Military ways of thinking are converted into proposals put forward by the military, which are then executed by the military. To wrap up—a question that is rather similar to ones I have asked already, but please let me ask again—after the next election, in what form will ISOC endure ? The role of ISOC will endure without a doubt. The laws that have been crucial in maintaining ISOC’s existence in the long term were pushed out under the government of General Surayud Chulanont who came into power after the coup of 2006. The security legislation that came out in 2007 [the 2008 Internal Security Act] reflected a period where the military did not think it would be in power for long at all. So the military wanted to ensure that ISOC and its other machinery would still be able to exercise influence and interfere in state institutions. That security legislation vested ISOC, especially during states of emergency, with the power to command and coordinate all state institutions under the excuse of “internal security”—even when interpretations of “internal security” can be so broad as to lack any limits. So even when the NCPO is no longer in power, ISOC will endure. Its authority will endure and this is a condition that is extremely difficult to reform. Previously, ISOC existed under a prime ministerial order [Prime Minister’s Order No. 157/2542 issued during the Chuan Leekpai government and later Prime Minister’s Order No. 158/2545 issued during the Thaksin government]. It is extremely easy to overturn a prime ministerial order and in turn dismantle ISOC—just a matter of promulgating another prime ministerial order which automatically passes through the cabinet. Done. But that’s no longer possible because ISOC is now legitimised in security legislation. Once an institution is made permanent via an Act, amendments have to pass through parliament. Dismantling ISOC is now more difficult. What is more, its status as a permanent agency means ISOC receives a budget directly from the Bureau of the Budget, and the sum is increasing every year. ISOC is an extremely important legacy of the military whose ramifications will fester throughout Thai society for a long time. Reform of the military cannot avoid considering the role of ISOC, since its influence permeates every state institution. Do you think that ISOC will be able to dominate a civilian government if one emerges from the next election ? The military and traditional elites will reserve the capacity to use the machinery commanded by ISOC to undermine the elected government—whether by mobilising people to actively oppose the government or via more insidious ideology.